Hi dear friends, it would be really nice if someone can help us with our project. We want to use 3g data connection to send message back to our own server. Currently we are testing on the website that is provided by the Sparqee (www.dbunplugged.com). We are using arduino uno and sparqee cellv1.0. 1. what's the correct connection between arduino uno and module. We get really confused with 3.3v, 5v , tx rx and other pins. 2. how to wake up the module. How did you then test the SIM card and the 3G if you can't get the module working? Vin is connected to VBUS. If you're not using USB, only VIN needs power and there is an onboard regulator. 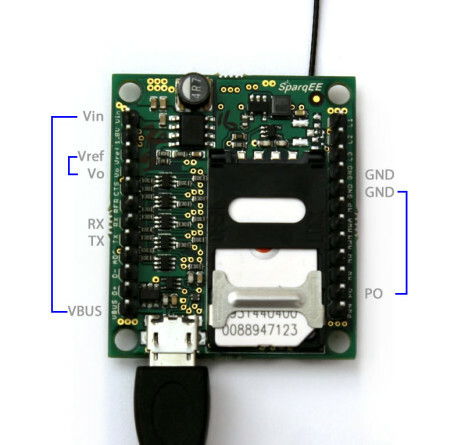 Vref is supposed to be the power level of the IO pins of your connecting board - so on an arduino, connect it to Vref on the Arduino (5v or 3.3V depending on the model). GND is to GND and PO to an IO which can momentarily bring it low to turn on. Then obviously RX and TX are the UART pins. If you're not using the arduino shield (http://www.sparqee.com/portfolio/sparqee-shielda/), you'll need to modify the code or just use the generic CELLv1.0 code. This is because the shield looks for specific pins (which you can mirror with jumper wires by looking at the schematic. If you're just looking at above image and using minimal pins, your monitoring pins need to be chosen based on your needs/desires/options - for example, you might not have 3 DIO pin on the network status (red, blue, green) indicating power and network connectivity - although I would suggest those are the three pins to use in order to monitor - if one of them is on, the module is on, and if green or blue is on, it's connected to a network. Thank you so much for your reply. The module is working when we test it but when we connect it with arduino uno, it says module is sleeping and check power. So can we ask more details how shall we connect with arduino uno? Thank you so much. stupidteddy wrote: Thank you so much for your reply. The module is working when we test it but when we connect it with arduino uno, it says module is sleeping and check power. So can we ask more details how shall we connect with arduino uno? Thank you so much. Can you be more specific on what you're seeing... an exact screenshot of the code would point at where the issue is coming from. Did the lights turn on - red, blue, green or are you testing those pins? You'll need to test them with resistors. The cell is also connected to the main power supply via the adapter. I also momentarily pull-down PO using PIN 9. Followed by monitoring both arduinos on serial monitors but there is no response from the CELL. Is PO connected to the arduino and set high or floating? Leave it floating if ur just manually toggling it. I would check the polarity of the tx/rx as nothing is popping out as wrong at the moment. And by check I just mean flip. If you can status the 3 network pins (red green blue), thatd be helpful. 10k resistor from vdd to the pin then monitor the pin. Or put an led+res across to simply see the light to know whats happening a little better. I have tried swapping around the rx/tx pin but there is still no reply from the arduino. I am using the sample arduino shieldA_talk program and just deleted the call function of cmd_power() and gpio_turnOn(). Instead, i just toggle the PO pin from HIGH to LOW and back to HIGH again. What do you mean by "dio pint to connect to arduino 2". on your second arduino, if you directly connect rx to tx, do you see an echo when you type? Do you have a shield or just the CELLv1.0? Because the shield will give you extra indicator lights. I mean you're not initializing the serial driver, so if you're not initializing the driver for the HW serial and SW serial, then it wont work in general.